Thanks also to all the businesses who very kindly donated prizes for our draw and to all those who sold tickets on our behalf. In Louise’s words … “we could not do what we do without people like you”. More good news to end the year was that today we had the pleasure of transporting Flan, one of our donkeys, to his new home. No doubt you will share in our good wishes to him and we hope he enjoys ringing in the new year with his new friends and family. We are hopeful that in the coming week or so another three of our donkeys will also be making their way to their new home together. 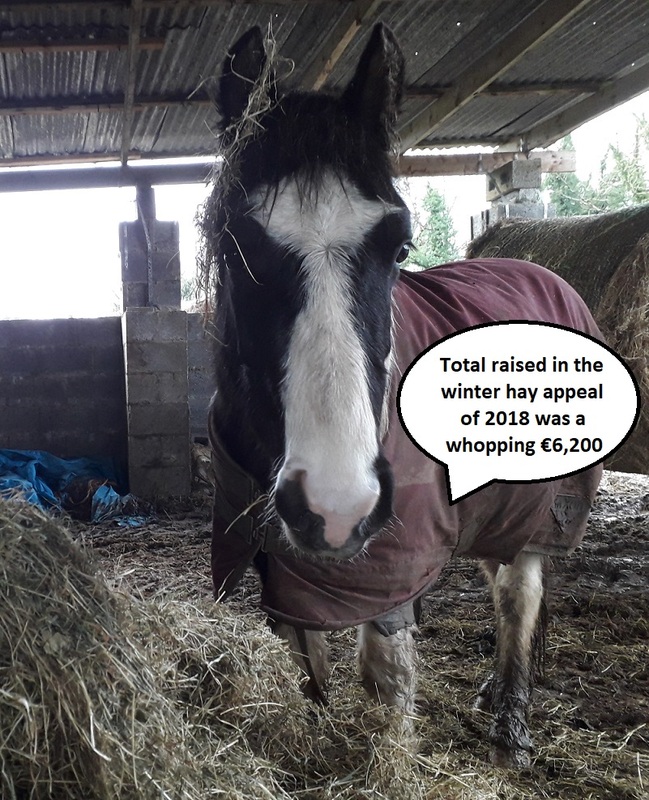 Of course as is the nature of this ‘business’ we have been asked to collect a donkey mare & foal from a farmer who took them in off the road a few months ago but has failed to trace who owned them (no microchips as usual) or find an alternative home for them. Swings & roundabouts as they say, no sooner have some departed than others have arrived to fill their spaces. Milo providing a ‘meals on legs’ service!! 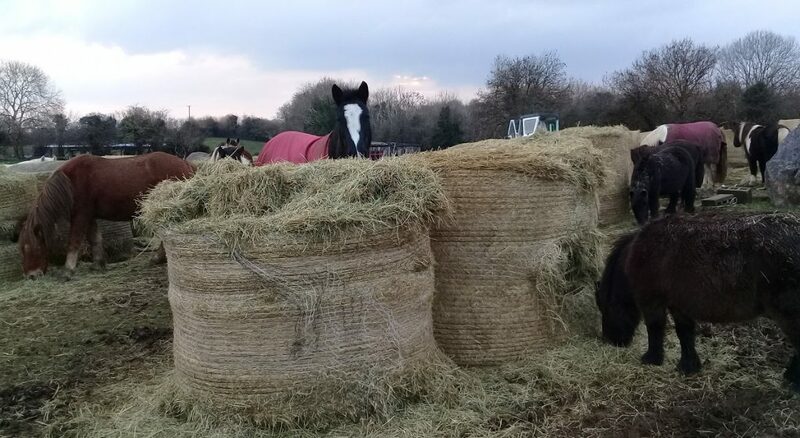 In any event we are keeping this as a positive update post so here is a photo we took the other day when it was quite windy whilst putting out bales for the gang … little Milo was a bit too close to a new bale which quickly got surrounded by some of the bigger horses and within minutes he looked like hay on legs. 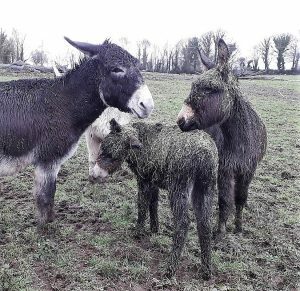 Luckily after doing a few of his bad braying attempts he found Marcie, his mother, and Mattie, his older brother, who quite willingly commenced eating the hay straight off him!!! 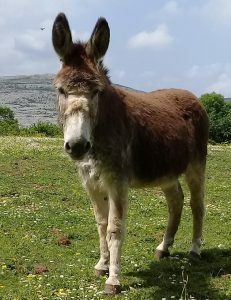 A few minutes after taking this photo Milo was surrounded with other curious donkeys and ponies so it was not long before his coat of hay vanished into nothing more than a memory. Wishing you all a happy, successful and joy filled New Year – Thanks for all your support in 2018. Here is hoping that 2019 brings all of you good fortune in all you do.